Xenon be gone, peak through the slit and be LED into the light…the pE-340fura. As they bask in the success of their new brighter world, the magicians in the CoolLED cave have been working furiously into the night driven by their favourite calcium enriched drinks. Achieved through partnership with The University of Strathclyde, CoolLED are excited to announce the latest leap forward in LED illumination for microscopy. Utilizing the highly successful pE-300 Series platform, the pE-340fura is a bespoke LED Illumination System for Fura-2 ratiometric calcium imaging, which also supports everyday fluorescence microscopy in a compact and affordable package. 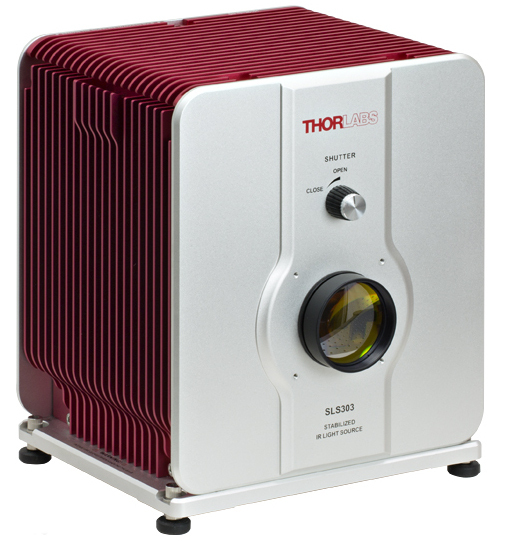 Thorlabs' new Silicon Nitride Globar Lamp is designed to provide 4.5 W of free-space illumination over the 550 nm - 15 µm range. An internal feedback system is employed to achieve a highly stable power output (0.05% fluctuation). The high-power output is collimated into a Ø35 mm beam for free-space applications. An aluminum reflector collects light from the silicon nitride Globar element and reflects it towards the front of the housing in order to maximize the output power. The mirror alignment is factory set to maximize the output, but it can also be adjusted by the user using the three adjustment knobs on the back of the housing. Energetiq Technology, a world leader in ultra-high brightness light sources for advanced technology applications, is introducing a smart controller for its Laser-Driven Light Sources at Photonics West 2013. Developed for the groundbreaking EQ-99 series of Laser-Driven Light Sources (LDLSTM), the EQ-99 Manager enhances functionality by adding a USB interface and an advanced shutter control system for greater integration and advanced control.